Sheds - Who Has The Best Sheds In The UK? 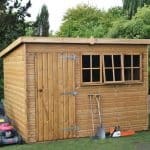 Sheds come in all shapes and sizes, and made from many substrates, but the very best examples can transform your garden experience as well as providing a stable and secure storage solution. With so many to select from, choosing the one that’s right for you can seem difficult. That’s why WhatShed have created this league table of the very best sheds that can be bought online in the UK today. Just below, we’ll discuss the criteria we used to select our twenty best sheds. During our deliberations we considered many important factors, from price and overall value for money, to visual appeal, toughness and build quality, and the warranty period provided by the manufacturer. Sheds come in a wide range of sizes and styles, so the only criteria we used when creating this league table was that all the featured sheds must have a base area of less than twelve foot by ten foot. This ruled out the larger garden buildings that were primarily designed as workshops or garages. With wooden, plastic, and metal sheds to choose from, selecting an overall champion was a very difficult task. Congratulations go the twelve foot by eight foot Shed-Plus shed with log store. 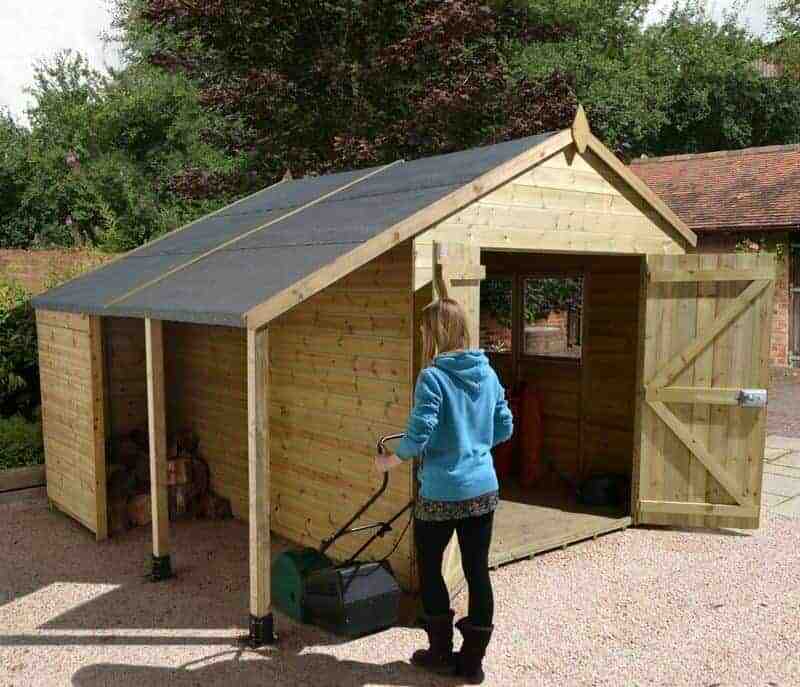 It may not be the cheapest shed here, but it’s very tough and durable and has value adding features, helping it top our list of the very best sheds that can be purchased online in the UK today. From sheds to greenhouses, the independent reviews from WhatShed can help you make a perfect purchasing decision. In this WhatShed league table you’ll find sheds made of wood, plastic and metal, but the top spot is taken by a large timber shed that offers something a little extra. As well as the main body of the shed itself, the apex roof overhangs on the right, creating a log store area that will prove very useful for the growing numbers of people that have log burning stoves and fires. Alternatively, this area,which is enclosed at the rear but open at the front, can be used to hold gardening essentials such as bags of soil, compost and aggregate. With a twelve foot by eight foot base area these sheds can hold a lot of goods, so we were pleased to find that they they have double hinged doors that open to a five foot width, and that the doors come with a key operated lock. This makes it very easy to move even wide or bulky objects in and out. We were also impressed by how tough and stable the building as a whole should feel, thanks to its heavy duty framing. It should also prove very durable, as the initial pressure treatment means that it comes with the reassurance of a 15 year guarantee. The price tag may put it beyond the reach of some, but these value adding features allow it to take top spot in this highly competitive league table. The diversity of sheds available to buy online in the UK is shown by the difference between the top two in our table. Our runner up shed has a hot dipped galvanised steel cladding, but this makes it very weather and rust resistant. That’s one reason that the manufacturer has been able to provide a long 20 year anti-rust guarantee, and of course unlike many wooden sheds we’ve reviewed this isn’t dependent upon an annual treatment schedule being adhered to. 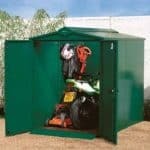 This also helps to make it superb value for money, and at less than three hundred pounds for this compact shed it is certainly one to consider for those on a tight budget. If you think that all metal sheds look dull and metallic, then these Grandale models could be the ones to change your mind. The predominant colour is a royal blue, which is something we rarely see used on sheds but one that we found both eye catching and appealing. It contrasts nicely with the cream detailing used around the sliding double doors and the apex roof that has a peak height of 1.93m. We were also pleased to find that the cladding, at 0.3mm, is slightly thicker than we sometimes see used on such affordable metal sheds. The third of the very best sheds available to buy online in the UK is made of yet another substrate, plastic. For many people this will be the most convenient form of shed, as it’s immune to rust and rot, and won’t be affected by insects or rodents. This means that they’re typically very durable, and they also require little or no maintenance other than a hose down occasionally. That’s why we would expect this shed to last even longer than its 15 year warranty suggests, and this adds even more value to a very reasonable asking price of less than three hundred and fifty pounds. 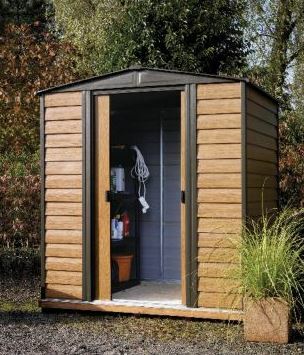 What really made this stand out from many of the other plastic clad sheds we’ve reviewed is that it has a light cream brown colour scheme that has been given a woodgrain effect. Whilst this doesn’t make it look like natural wood it does give it a very eye catching and stylish appearance, making this the most visually striking plastic shed that we’ve seen. We were also pleased to find that it comes with a foundation kit included as standard, so that it’s easy to install even on property that doesn’t currently have a suitably flat area of concrete to use as a base. If you’re looking for a shed that’s tough and reliable, then the Trimetals Titan 680 is hard to beat, which is why it gains a place inside our top five despite being more expensive than most metal sheds that we review with an asking price of just under a thousand pounds. We were very impressed by its strength and durability, and that’s down to the use of galvanised coated steel that’s then been coated in PVC to give added weather protection. It’s for that reason that the manufacturer has been able to supply a 25 year guarantee, which is as long as we find on any sheds made from any substrate. It also means that the shed is very fire resistant, and in fact it has been fire rated to classes 0 and 1, which we found reassuring. We also found these metal sheds more attractive than most of their steel competitors, and we were particularly glad to see the inclusion of an acrylic window next to the single hinged door. This means that the interior is well illuminated, which should make it a pleasant environment to spend time inside. Yet another positive is that the aforementioned door comes complete with a key operated lock, so this is a good choice if you want a mid sized secure storage solution for your garden. 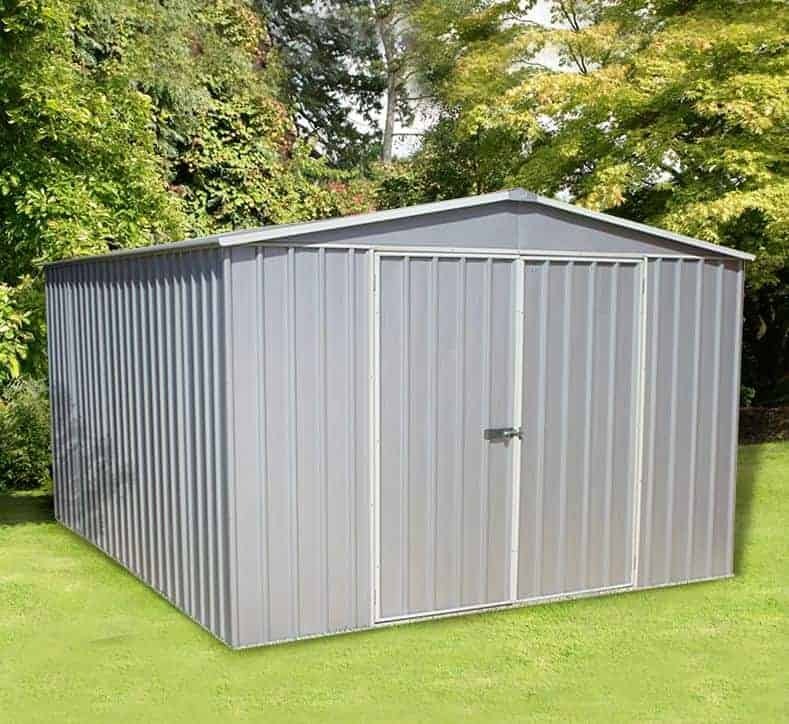 Value for money is something that we rate highly, which is why this compact metal shed from the BillyOh range gains the final position in the top quarter of our league table. 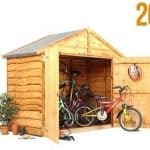 At not much more than a hundred and fifty pounds it’s the cheapest of all the sheds in our top twenty, and yet we were pleased to find that didn’t mean that the manufacturer had taken shortcuts with the quality of components or the design. An indication of this is the 15 year no perforation guarantee, which we feel is very generous at this highly affordable price, and we also liked the all green colour scheme. This is also one of the smaller sheds to feature here, with a base area of approximately six foot by four foot. This, however, makes it ideal for gardens with a limited amount of lawn space, and there’s still enough room inside for a decent selection of tools and even a lawn mower. It also has a pent roof, meaning that you may be able to fit it under overhanging branches where traditional apex sheds would be unsuitable. Another advantage is that it features an entrance and exit ramp coming out from the double sliding doors facilitating the use of a wheelbarrow, which again is something that we wouldn’t usually expect to see at this price. One of the great advantages that larger sheds such as this bring is that they give added versatility. In fact, flexibility is at the heart of this shed as it offers two garden buildings in one. The majority of the 10 foot by 8 foot base area is devoted to the main area of the shed itself, with two windows giving it lots of light which means that it’s an ideal garden location to work in. At the rear is a secure storage area, accessible via its own personnel door, and this has no windows looking in on it. That means that passers by will have no way of seeing if anything valuable is being stored inside, boosting its security. We were pleased to find that both the single door and the large double doors to the front have a key operated lock, making these some of the more secure wooden sheds that we’ve reviewed. The use of toughened safety glass in the windows also helps, as they are virtually shatter proof and therefore very resistant to break ins. We were also pleased to see that all of the timber had been pressure treated, giving it a 15 year warranty against rot. Only the relatively high price prevented this from being ranked much higher up our league table. 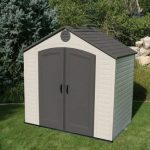 These apex roofed Absco sheds may not be the most excitingly styled garden buildings that we’ve reviewed, which is the only factor stopping them from being even further up our list, but they are among the toughest and the most practical. Made by one of Australia’s foremost shed manufacturers they’ve been built to withstand the tough weather conditions that country can sometimes offer up; for example, they’ve been tested to withstand winds in excess of ninety miles per hour, making them an ideal choice for people who live in an open area that is often exposed to storms and strong winds. 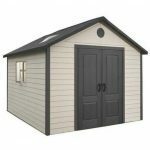 What we also liked about these large sheds is that, despite their size, they should be incredibly easy to install. That’s because they use a patented assembly system unique to Absco known as SnapTite. It means that the metal panels simply snap into place along a series of channels, and the owner won’t need any specialist tools. Once up, the shed should feel very stable, and its durability and excellent weather and rust resistance is confirmed by its generous 20 year guarantee. 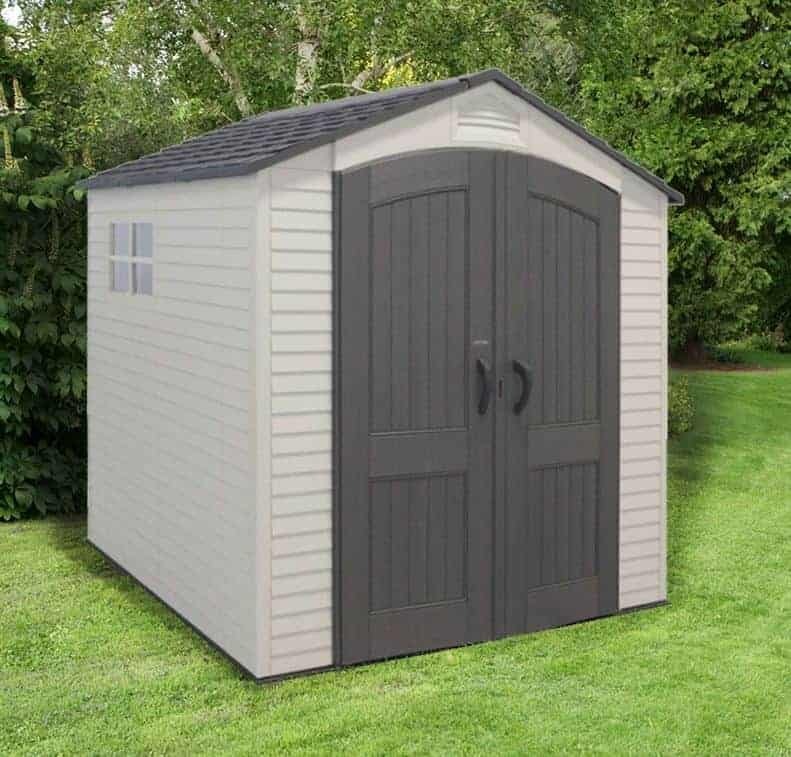 The uniformly grey colour scheme may not be to everyone’s taste, but if you prize performance over looks this shed is hard to beat at a very reasonable asking price. The majority of timber sheds in this top twenty league table feature shiplap or tongue and groove cladding, a high quality substrate that is thick and strong. This is the first shed in our guide to have overlap cladding, but even though this means that the cladding is thinner and lighter, it should still feels stable once installed. It’s also just as effective as keeping rain out, as it is simply carried away by the overlapping boards and by the felt covered apex roof. Overlap cladding is a very cost effective option, which is why it’s available at such a great value price. It also comes with a 15 year anti-rot guarantee, which adds even more value, which is why it gains such a lofty position here. The long guarantee is provided because the sheds have been given an initial pressure treatment, and this also negates the need for annual treatments to be carried out by the owner. 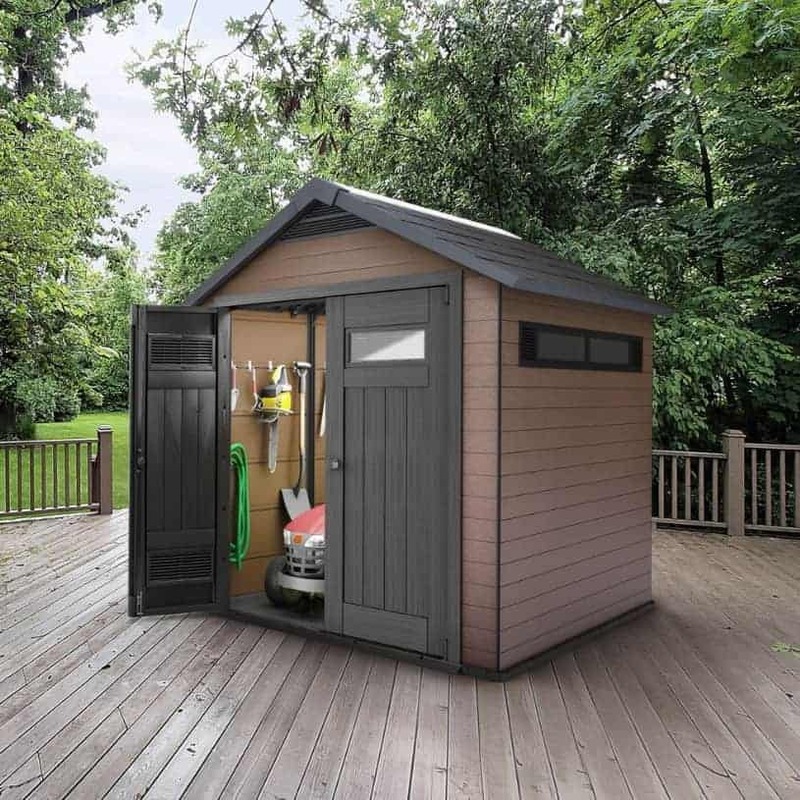 The thing that most impressed us about this shed, however, was the inclusion of a lean to, which we wouldn’t expect to see on a six foot by four foot garden shed. 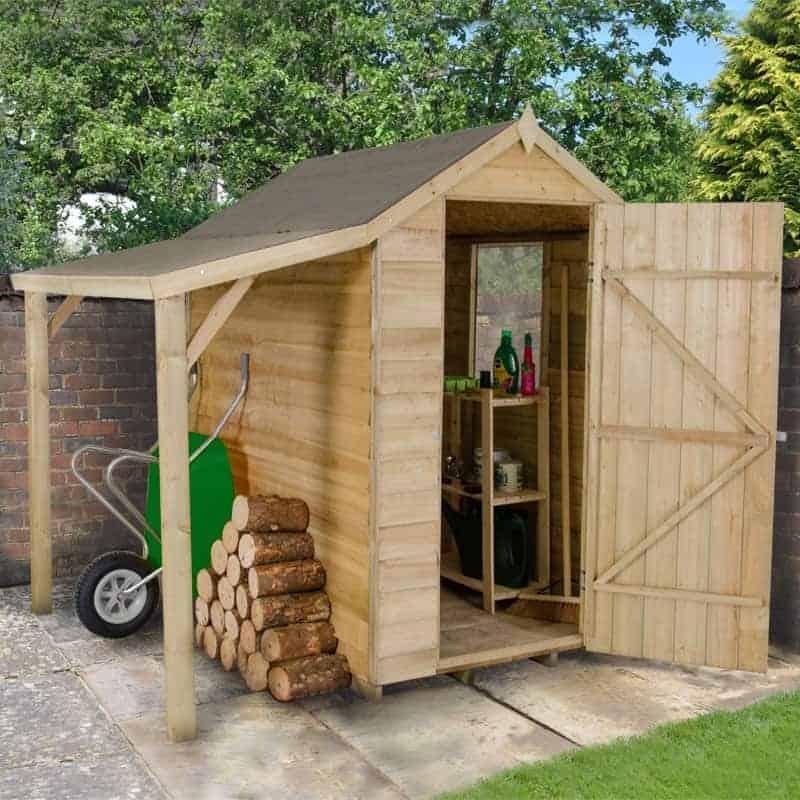 This covered area can be used as a log store, or an external storage area for items such as wheelbarrows and bags of soil. Metal sheds don’t have to be variations of silver and grey, and we often see galvanised steel cladding that has been painted in a dark green colour. The colour scheme of this shed caught our eye from the moment we saw it, however, as it is in a lighter lime green shade that we rarely see. We found it very visually appealing, and it should blend in well to a typical garden background. As it’s painted inside and out it also has excellent protection against rain and against condensation. This means that Yardmaster have been able to supply a 12 year guarantee against rust, which whilst not as long as some is still two years more than we see on the majority of sheds that we review. The paintwork isn’t the only thing that caught our eye, as the cladding on these sheds is designed to resemble shiplap, emphasising its wood like appearance. 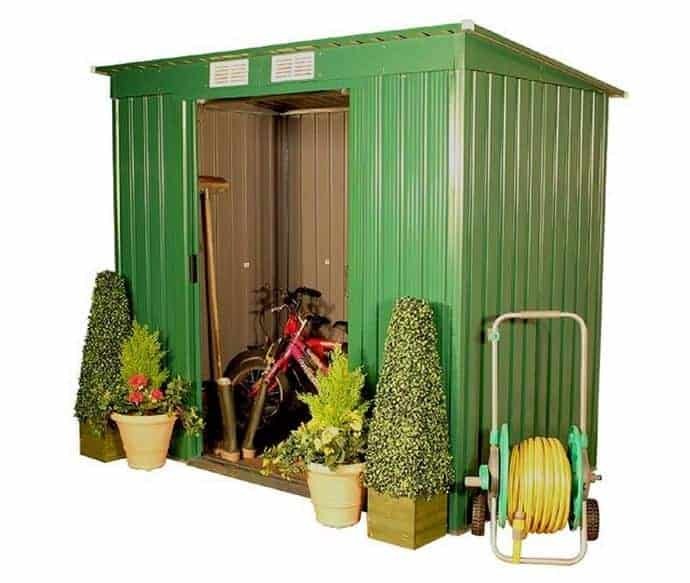 For that reason, this would be a good choice for people who like the benefits of metal sheds but don’t want anything that looks too obviously metallic in their garden. 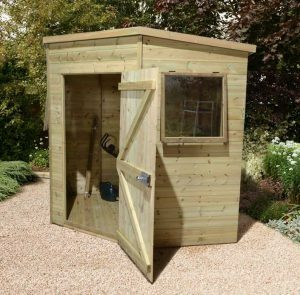 It also provides very good value for a shed of nearly ten foot by eight foot, with a very competitive asking price of less than four hundred pounds. 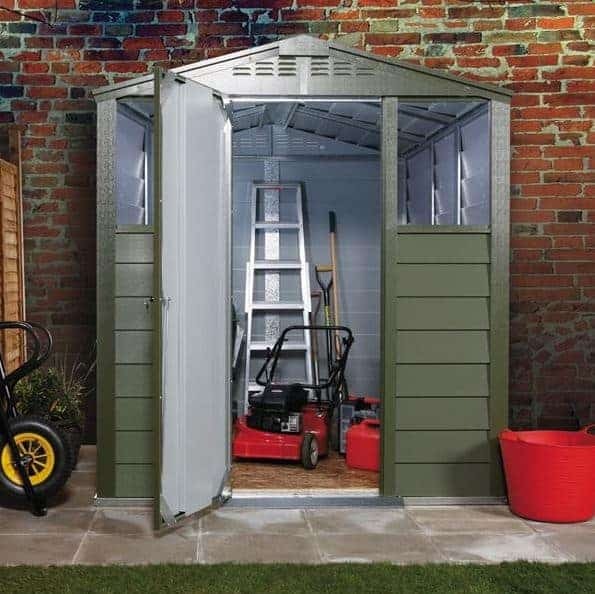 With reports of shed crimes on the rise, it makes sense to take security seriously. One solution is to have a shed that has no windows, which means that passers by will not be able to see if anything valuable is kept inside, which in turn makes it less likely that opportune thieves will target it. This means that there is no natural light inside, however, so we were pleased to find that these BillyOh wooden sheds offer another solution. Two relatively narrow windows allow just enough light in to ensure that storing and retrieving items is easy, and yet because they are positioned high up and just below the eaves it still makes it difficult for prying eyes to see inside. This smart solution helps this shed gain the final spot inside our league table’s first half. 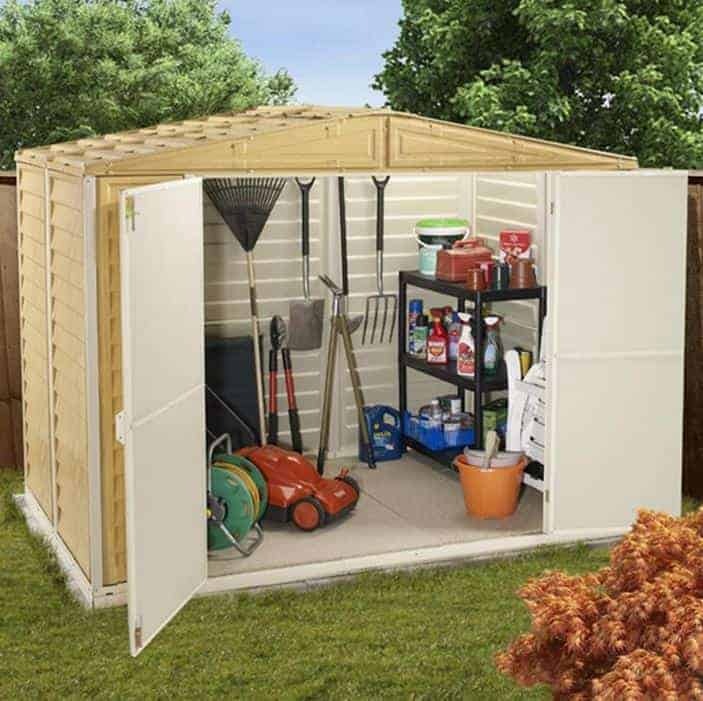 With a six foot by four foot base area, these sheds are ideal for those who want a handy yet compact storage facility that won’t take up too much of their precious lawn space. At less than two hundred pounds we feel that it’s also very reasonably priced, particularly as it is made of high quality tongue and groove timber that’s protected by a 10 year manufacturer’s guarantee against wet rot. We’ve reviewed lots of Keter sheds, and we’re invariably impressed with their contemporary styling that makes them stand out from their competitors. This six foot by six foot model is a perfect example, with its grey and white colour scheme really catching the eye, especially as the cladding also features a woodgrain effect. It also has a small square window on a side panel, which is something we rarely see on a plastic shed, and that allows the owner to look out at their garden. Extra light is provided by the skylight in the centre of the apex roof, so the interior should be very well illuminated on a warm day. This is one of the toughest plastic sheds we’ve reviewed, and that’s because the polypropylene cladding is supported by steel reinforcements. It means that whilst it’s lightweight and should therefore be easy to assemble, it’s also very stable once installed. We would have liked to see a longer warranty period than the 10 years provided by Keter, but as it’s immune to the threat of rot and rust we would expect it to last much longer than this suggests without any problems becoming apparent. The four hundred pound plus price tag, however, is a little more than we find on many sheds of this size we review, which is why it just misses out on the top ten. We always like sheds that have a unique and stylish look, and that certainly describes this six foot by four foot model that’s endorsed by the Woodland Trust. 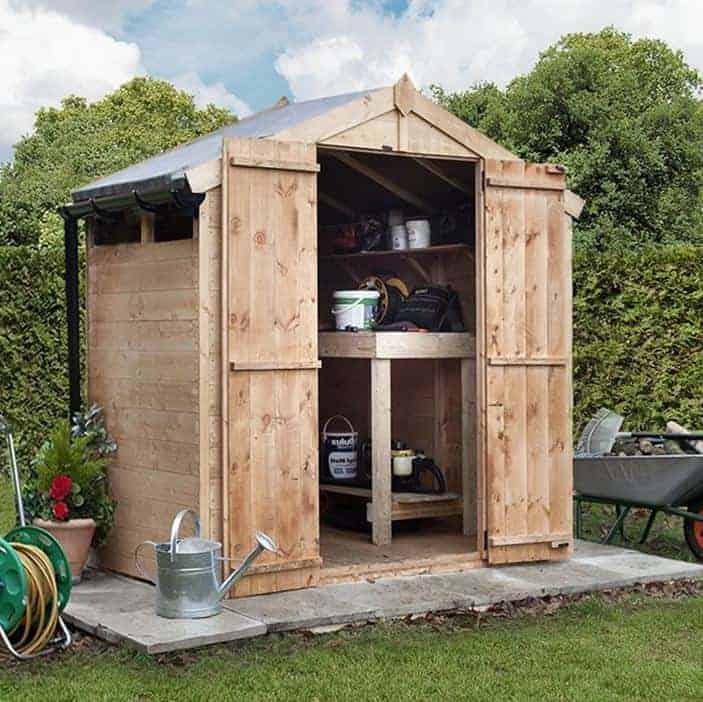 It’s one of the most visually striking timber sheds that we’ve seen, so it can become a much loved garden feature in its own right as well as being a convenient and well built place to store tools and gardening supplies. The feature that caught our eye instantly was the curved roof, a stylish alternative to a traditional pent roof. We also liked the two long windows, one on each side panel, that should allow lots of natural light to enter in. Whilst these are among the most compact sheds in our league table, they’re also among the strongest. That’s because they use 16mm shiplap plus cladding rather than the 12mm thickness that we usually see on even the highest quality wooden sheds. Whilst they come with a 10 year guarantee, they should prove to be very tough and durable as long as the annual treatment schedule is kept up. We were also pleased to find that 5% of the sale proceeds are donated to the Woodland Trust, an important and very appropriate charity that helps protect and nurture Britain’s woodland. 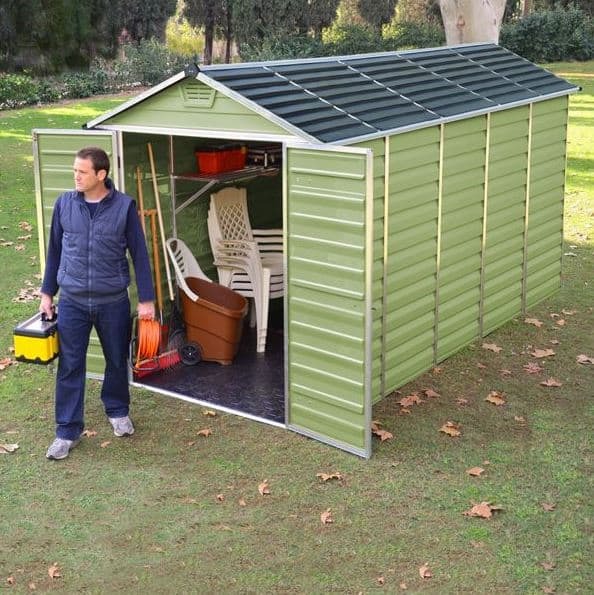 If you have a large garden, then large sheds such as this one can make life so much easier. With a base that’s approximately twelve foot by eight foot there’s enough room inside to use this for large scale storage purposes. We can also imagine it being used as a garden office for those who work from home, or even as a small scale workshop for either business or leisure purposes. With a taller than average apex roof as well the owner can move around in comfort. When this versatility is taken into account, we feel the asking price of less than seven hundred pounds is reasonable value for money, which helps this shed gain a place inside our top twenty guide. We found these sheds to be very imposing and stylish, thanks to the use of high quality tongue and groove cladding and a diamond shaped finial. The bank of windows along the full length of one side are also striking, and they should ensure that every inch of the shed’s interior receives daylight. On the downside, we were a little disappointed to see that no floor is included as standard, although a choice of two floors can be added as an optional extra at the point of purchase. Whilst the previous shed in our list was conspicuous for its lack of a floor, this one stands out from many of its competitors because it features a floor as standard. That’s something that’s unusual in metal sheds, which are often designed to be fitted directly onto flat areas of concrete and paving. 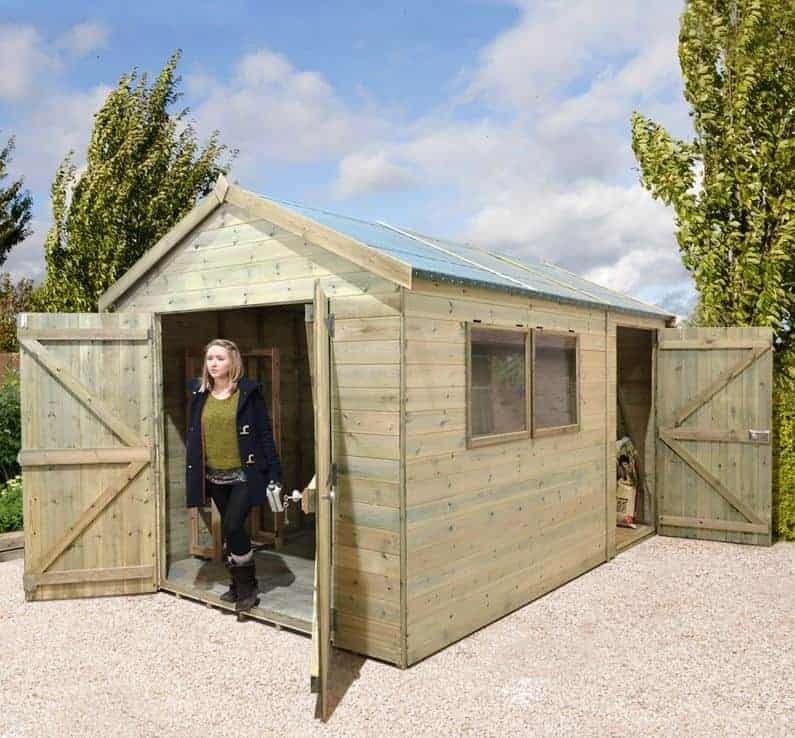 We found that it makes the shed feel warmer and more homely, and this adds extra value to what is already a very competitively priced six foot by four foot shed. We liked the use of brown cladding on these sheds, with the lighter coffee brown coloured walls contrasting nicely with the chocolate brown apex roof and detailing around the double sliding doors. As the metal cladding has also been arranged in a shiplap style, and has a woodgrain effect added to it, this really does look like a timber shed from a distance, so it’s a good choice for those who like the classic look of a wooden garden shed and yet don’t like the idea of adding annual wood preserver treatments as wooden sheds often call for. As it is, a 10 year manufacturer’s warranty against perforations caused by rust is provided by the manufacturer here, with no maintenance required other than cleaning. 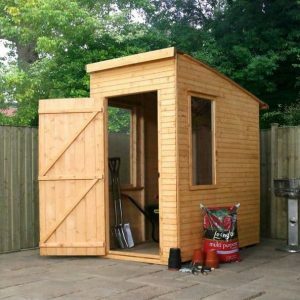 If you want the advantages that a seven foot by seven foot shed can bring, but don’t have a lot of space in your garden to position one, then this could be the perfect solution. It has a five sided design that allows it to fit snugly into the corner of a garden, providing storage space whilst minimising the effect on its surroundings. It also has a pent rather than apex roof, which means that you won’t have to worry about overhanging branches and foliage. 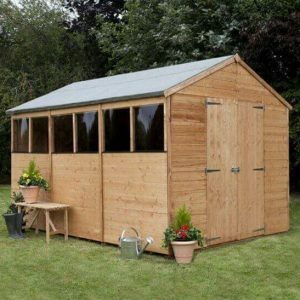 For those reasons, we can see this tough and durable shed appealing to a lot of people, and only the price tag of nearly a thousand pounds prevents it from reaching the upper sections of our league table. Corner sheds such as this can also be hidden away behind a fence, hiding them out of sight of passers by. This is a big boost to security, and we were impressed by just how secure the shed should be as a whole is. Toughened glass is used for the glazing in the two windows, and is virtually shatter proof. The single door has three heavy duty hinges that are internally positioned, and with a key operated lock included as well it’s very difficult to gain unauthorised access. We were also pleased to find that an initial pressure treatment had been applied, meaning that this shed comes with a 15 year anti-rot guarantee. 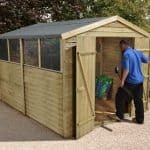 For many small to mid sized gardens, seven foot by seven foot sheds such as these are ideal as they offer a relatively large storage space without taking up too much precious garden space. This looks very different to most seven foot sheds that we’ve reviewed, however, as it utilises a Dutch barn design that we found very aesthetically appealing. What gives it this unique appearance is the four sided curving roof with decorative wooden struts coming down from it. If you’re looking for a shed that will impress your neighbours and friends from the moment they see it, then this is certainly one for the shortlist. 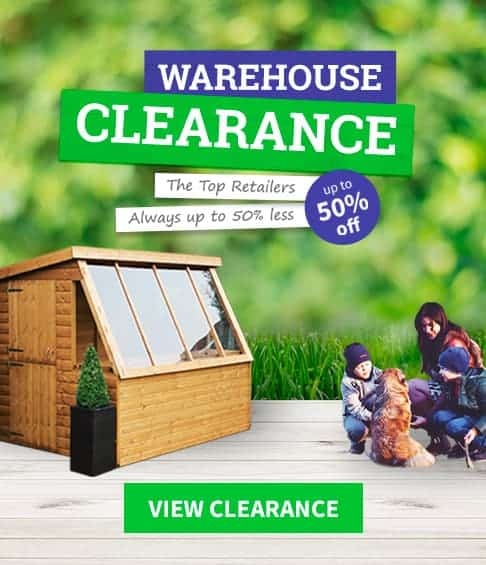 The large square window on one of the European pine shiplap side panels features horticultural glass rather than the styrene that we often see on mid sized wooden sheds, making this even better value for money at just under six hundred pounds. 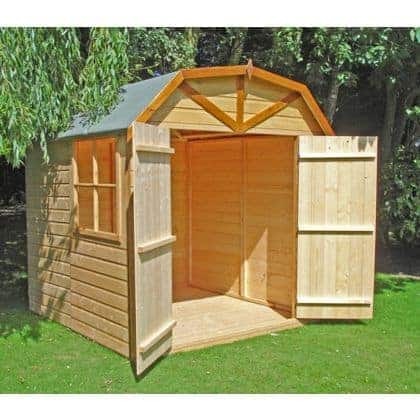 It’s this value, allied to an original and eye catching design, that gains this shed a place inside our top twenty, and a 10 year warranty is provided against rot too. This is conditional upon an annual treatment schedule being kept up by the owner, but on a shed of this size that shouldn’t prove too onerous or costly a task. These plastic sheds from Avon caught our eye for two reasons: firstly, we liked the olive green colour scheme that has been applied across the polycarbonate cladding, allowing it to fit nicely into a green garden setting. Secondly, it’s twice as long as it is wide, making it ideal for narrow gardens. With a six foot by twelve foot base area, there’s lots of storage space inside, and we were impressed by the wide opening double hinged doors at the front. With a ramp also at the front, moving large, bulky or wide objects in and out is easy, and thanks to its generous dimensions and non-flammable nature we can easily imagine it being used as an all weather store for motorcycles. Thanks to their steel and aluminium frame, we imagine these should feel stronger and more stable than many other plastic sheds we’ve reviewed. This is also helped by the inclusion of an integrated floor as standard, and we were pleased to find that it has easy grip qualities, which is good news for people who’ve just walked in from a damp or muddy garden. We would have liked to see a longer warranty period than the 10 years provided here, however, and this and the slightly above average price accounts for its position towards the foot of our league table. 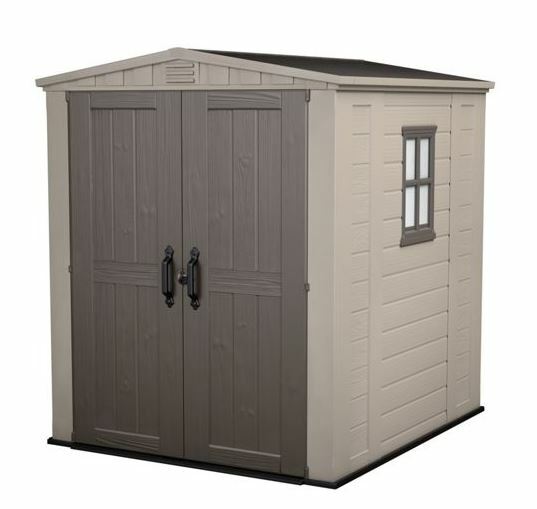 The plastic sheds in the Lifetime range always impress us with their durability and design, and this seven foot by seven foot model is an ideal example of that. The white and dark grey colour scheme makes it stand out from the majority of plastic sheds that we see, as does the inclusion of a small plastic window towards the rear. It’s a nice touch which allows the owner to see out into their garden, as well as providing a little extra light to find items that have been stored within. The main source of light, however, are the skylights within the apex roof, and this combination makes it hard for passers by to see inside the shed, which is always something we welcome. One of the first things that caught our eye when reviewing these sheds was the set of double hinged doors. Not only because they are wide opening and make the transporting of goods in or out easy, but also because they have a curved top. It’s a stylish touch that shows how the manufacturer has paid attention the aesthetic impact of the shed, which isn’t always something that we see on plastic garden buildings. Made from high density polypropylene, over a strong powder coated steel frame, we would expect this to last longer than the 10 year warranty period suggests, but a higher than average selling price prevents this from rising further up our league table. The sheds in our top twenty league table are made of plastic, wood and metal, showing the diversity of models available to the public. Our penultimate entry, however, is something very different as it’s made from a composite material made of both wood and plastic. This, along with the attractive light brown and dark brown colour scheme, means that it has a timber like appearance and yet it provides the benefits associated with plastic sheds, in that it won’t rot or be damaged by insects. We liked the contemporary styling of these sheds, and they will certainly grab the attention of people who see them. The wide rectangular windows on both the double doors and side panels also help to create a very modern feel about this shed, as well as providing a good supply of natural light to the interior which is approximately seven and a half foot square. Glass is used rather than styrene, showing the attention to detail and quality the manufacturer has paid. 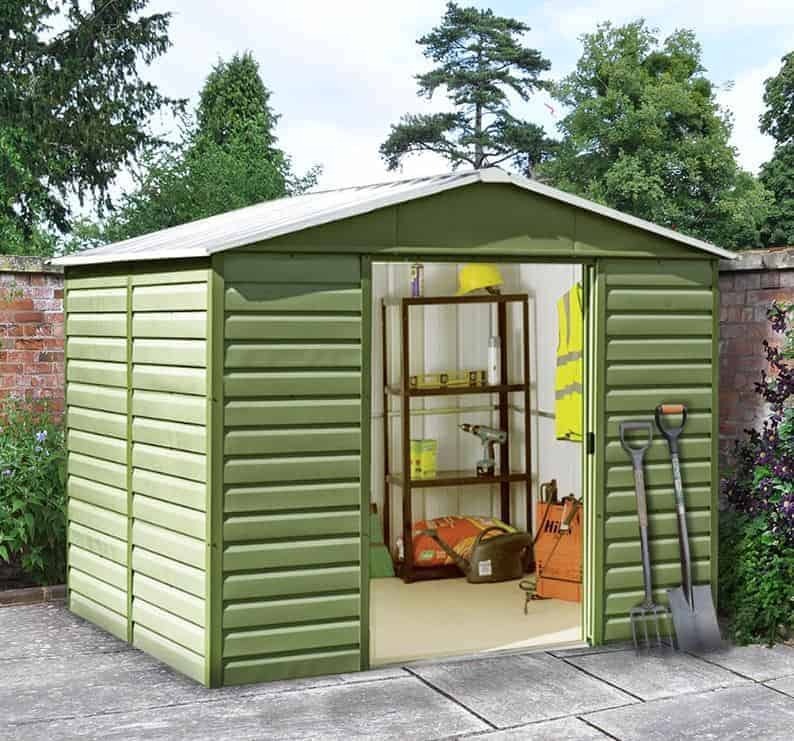 A 10 year warranty is included by the manufacturer, but at approaching a thousand pounds it does cost more than the majority of similarly sized sheds, which accounts for its position next to the foot of our WhatShed league table. As we’ve already seen, the very best plastic sheds can belie their dull reputation, and that point is emphasised by the final entry in our guide to the twenty best sheds that can be purchased online in the UK today. 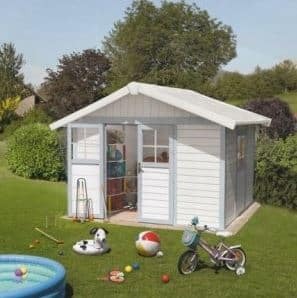 Made by Grosfillex, it takes the traditional design of a wooden garden shed and crafts it in durable PVC that is given a pastel blue and white colour scheme. We found it to be one of the most attractive garden buildings we’ve reviewed, and it’s also available in a pastel green colour. Also eye catching were the two square windows at the front of the double hinged doors. As these windows are at the front rather than on the sides, it may be possible to position the shed so that passers by can’t see inside, which is always a boost to security. A further boost is provided by the key operated locking system that comes as standard. Once again it’s the high asking price that prevents this shed from climbing higher, and at over fourteen hundred pounds this is the most expensive shed to gain a place inside our top twenty. 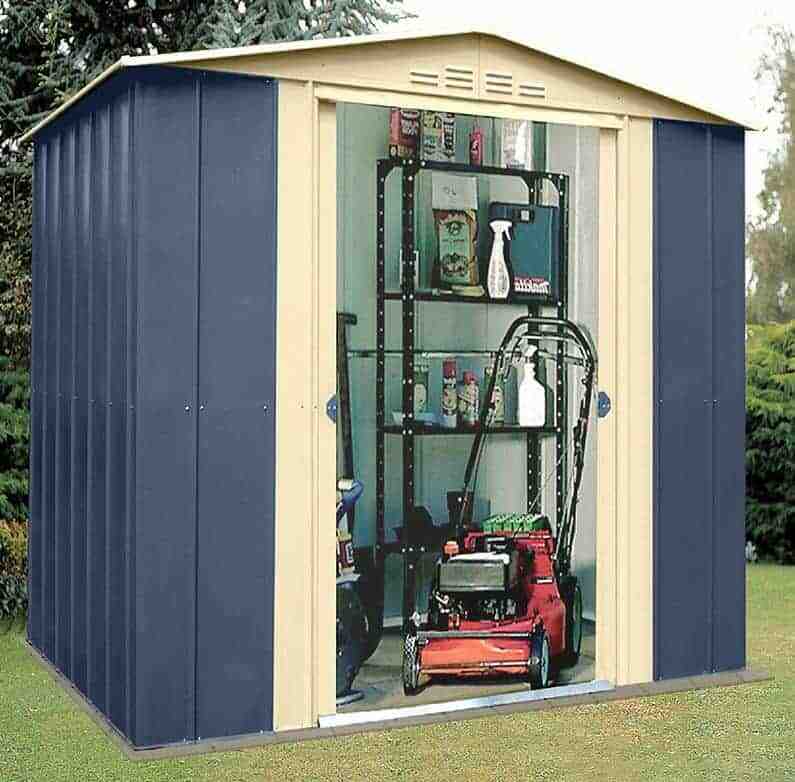 Nevertheless, if you have a budget that encompasses this price and want a unique, tough and good looking shed, this is well worth considering.